Updated: May 17, 2018, 10:34 p.m. 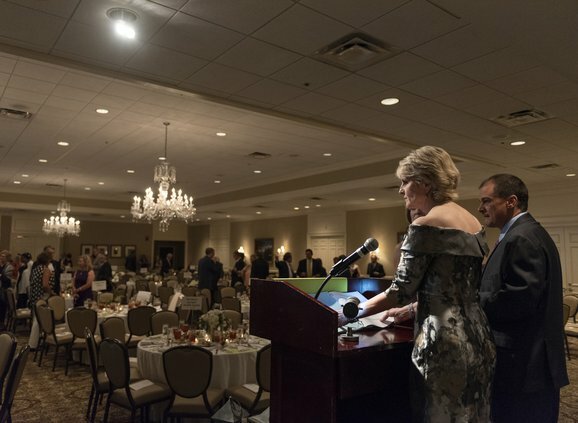 But, in looking forward as the Greater Hall Chamber of Commerce’s 2018-19 chairwoman, the president and CEO of the Northeast Georgia Health System also boasted about Hall County’s economy. “I don’t believe that any place is better positioned for continuous improvement than Gainesville and Hall County, so let’s continue together with this vibrant community to make a better tomorrow than we are today,” said Burrell, speaking Thursday, May 17, at the chamber’s 110th Annual Meeting & Gala at the Chattahoochee Country Club. In speaking to the crowd filling the Chattahoochee Country Club, she took the reins as the chamber’s leader from Perry Barnett. “I’m looking forward to attracting new business, developing small business and strengthening the international business,” Burrell said. Barnett also recapped his year at the helm. Barnett also noted the International Canoe Federation Dragon Boat World Championships set for Sept. 12-16 at Lake Lanier Olympic Park in Gainesville — the first time the event has been held in the U.S.
“I still don’t think we realize the magnitude of that event and how special it’s going to be to this community,” he said. The annual meeting was more than just a status report on area economic development efforts. It also served as a social event and dinner, as well as a time to honor volunteers and others in the community. The Distinguished Citizen Award was presented to Benny Bagwell, Jackson EMC’s district engineer and operations coordinator. “I’ve been blessed over the years … and I always felt like I should be giving back, and that’s what I try to do day in and day out,” Bagwell said. The W.G. Mealor Award, which recognizes a volunteer who goes beyond the call of duty and is named after the chamber’s first chairman, went to Paul Chambers, regional director of external affairs for AT&T. “Blessings, to me, connote you might have done something good along the way, but it’s really because there’s a father in heaven who has given us a life that we have been able to enjoy and hopefully give back to our community,” he said.